Leading Exporter of paper cutting machine, circle cutting machine ( round & square & paper cup blank ) and roll to sheet cutting machines from Faridabad. 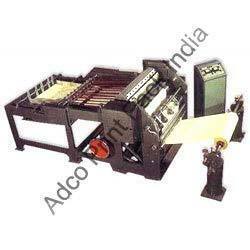 ADCO PRINT PACK INDIA Cutting Machines are designed and manufactured keeping in mind the theory and practical experience of many years of manufacturing.The best available raw material is used for long life and best workmanship. All safety measures are used and the machines are best suited for right angle cut. The parts are fitted accurately and the back gauge slides in a square groove to ensure against any cross cutting. Main Steel Parts are bright chrome nickel plated and the machine is best painted to give high class finished looks as well as best performance for long periods forever. The Machine can be operated by hand as well as by power. Our organization is counted amongst the most distinguished manufacturers, exporters, suppliers and traders of a comprehensive array of high quality Paper Plate Cutting Machinery. To manufacture our offered range of cutting machines, we have employed advanced technology and methodologies. Easy to operate, these machines are used in the corrugated products, packaging and allied industries. Low maintenance cost, sturdy construction, longer functional life are some of the highlighting features of offered Paper Plate Cutting Machinery. 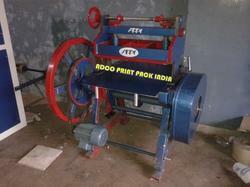 We are a prominent name, which is engaged in delivering a comprehensive range of Rool To Sheet Cutting Machines. The offered range is manufactured utilizing optimum grade raw material, which is procured from trustworthy vendors of the market. Furthermore, these sheet cutting machines are highly applauded among the clients for their accuracy in cutting paper and ply corrugated boards. This range is known for possessing adjustment options that results in more flexible working.